Please ensure you have added the remote IP to the allow list in your hosting control panel MariaDB - MySQL area. 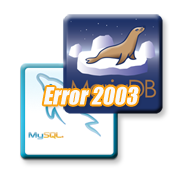 Contact us with a support ticket with the remote IP and we can allow it at the firewall for MariaDB - MySQL usage as well. If you are behind a personal or work router, make sure you have UDP and TCP endpoint filtering set to "Endpoint Independent".